The name Jackfruit has been popping up lately. 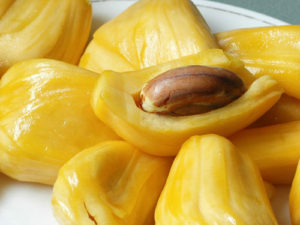 Do you know what a Jackfruit is? If not you should. Recent trend reports suggest it might become a staple at the breakfast and dinner tables. As someone who grew up eating Jackfruit like Americans eat apple, I can assure you if this trend holds true you’re hitting the jackpot with jackfruit. Big time! Jackfruit is an oversized fruit with a yellowish-green bumpy skin, with yellow fleshy pods on the inside. Both the flesh and seeds are edible. The flesh is firm, sweet and flavorful, and tastes like a bunch of tropical fruits rolled into one. The seeds are just as yummy when roasted. But one thing stood out to me when I read a recent article. So many of the foods I grew up on are now all the rage. Avocado, Coconut, Pomegranate are fruits I devoured as a child. Every yard had some sort of fruit tree in it so there was easy access. As a matter of fact, these fruits were so plentiful that many times they had fallen off the tree and you were doing yourself or someone a favor picking them up off the ground. Seriously, that’s how abundant these superfoods were. And, no doubt, still are. As I said, I grew up on these. Jackfruit is no different. I was so excited when I came across another article from Whole Foods that I contacted them immediately to see if they had it in store. And they do! I will be updating this post as soon as I get my paws on some Jackfruit. Please post your comments if you’re trying it for the first time or if your first bite brings back memories of childhood days.